Memoirs of a Geisha is a book that can transport you into a world so vivid that you feel like you were there. But also vicariously experience emotions with the characters. Therefore this is a book after my heart. Memoirs of a Geisha was just the perfect blend of what I want in a story. This book carries us along the coming-of-age tale of Chiyo —a girl thrust into a world of powerful men surrounded by delicate beauty. A world that Chiyo was sold as a slave to, where a woman’s beauty is a weapon as any other. And with a simple flick of an eye she can stumble a man. It felt like we accompanied Chiyo on her journey to make sense of the world she now had to navigate. Set in 1920’s Japan, the author’s intricate tale of the geisha world of Japan, seen through the eyes of Chiyo was as cut-throat and gritty as it was beautiful. From the detailed descriptions of the Kimonos the geisha’s wore, with small details about the significance of how a geisha wore her Kimono and why she wore it that way. The process of dressing up a geisha is an art in itself, with the final piece her transformation into a pearl of beauty. Golden also depicts through Hatsumumo how competitiveness can bring out the evil in people regardless of how delicate they look. Hatsumomo was the most renowned Geisha in the Gion —geisha district— but she felt threatened by the child Chiyo —thus making her life miserable. She saw the potential in Chiyo and felt threatened by that. After much difficulty and misfortune, Chiyo became the apprentice of a well respected geisha, who was her ticket to the glamorous world of Gion. From tea houses to theaters and wrestling matches in between Sayuri —Chiyo’s geisha name— was taken on a whirlwind adventure. And we had a front-row seat to. Sayuri had skills of fan dances, tea ceremonies, a sharp brain and her trademark piercing grey eyes. All this got her tangled in a love triangle between two friends, which will in time determine her fate. We also are an audience to Sayuri’s decade long ‘one-sided love’ with a man that was far beyond her reach. Every decision she made from the day she met him was centered around him—even becoming a geisha! Although the book is a work of fiction, Golden wrote it with such panache that the reader forgets that they are not reading a real auto-biography. I for one got so attached to the characters that I laughed when they did and cried when it was too overwhelming. Sayuri’s story was so believable that when I got to the last words I was a bit saddened that she didn’t exist. It was also interesting to see a different perspective of the war —albeit just a glimpse— during and after and how it affected different people. 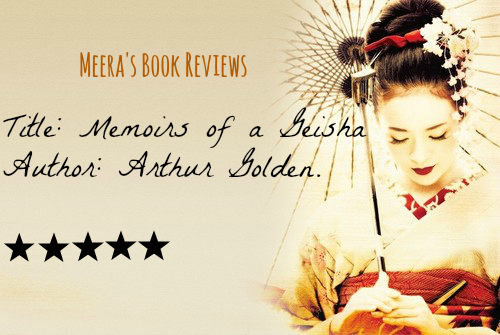 Golden’s Memoirs of a geisha is a work of history in it’s own way! If you haven’t read it, I highly recommend you get a copy of the book.